MOSCOW. 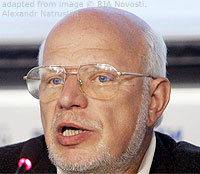 Dec 8 (Interfax) – The Russian presidential Council for human rights will be seeking changes to the law on foreign-agent nongovernmental organizations (NGOs) until it becomes workable, the Council’s chairman Mikhail Fedotov said. “We did not promise that we’d quit our attempts to improve it. We will continue these attempts until it becomes a normal, a quite workable law,” Fedotov told reporters after the Council held a meeting chaired by Russian President Vladimir Putin. Under its current version, “any organization can fall under the ‘foreign agent’ notion,” he said. The president agreed with a majority of remarks and suggestions made by human rights activists at the meeting, and instructed the first head of the Kremlin administration, Sergei Kiriyenko, to consider improvements to the NGOs law together with the Council for human rights, Fedotov said.